A few weeks ago, probably due to my recent Arduino and D-CPU obsessions, I started thinking about with this topic: How do modern computer CPUs add numbers? I took classes on this in school, so I had a basic understanding, but the more I thought about it, the more I realized that my ideas about how this would scale up to 64-bit computers would be too slow to actually work. I started digging around, and even though wikipedia is usually exhaustive (and often inscrutable) about obscure topics, I had reached the edge of the internet. Only context-less names like “Kogge-Stone” and unexplained box diagrams greeted me. I had to do actual research of the 20th-century kind. So come with me over the precipice and learn – in great detail – how to add numbers! I’m going to start out as if you’ve never taken a class in computer engineering. If you’re familiar with the basics of binary addition, skip below to get to the good stuff. We memorize this in school, but the reason it works is that each column is the same power of ten: 8 tens plus 4 tens is 12 tens. And 12 tens is really 1 hundred and 2 tens, so the 1 hundred is shifted/carried over to the hundreds column. This works the same in binary, but the digits can only ever be 0 or 1, so the biggest number we can add is 1 plus 1. This would be 2, or “10” in binary (1 two and 0 ones), so there’s a carry of 1. In fact, if we have a carry, 1 plus 1 with a carried 1 is 3: “11” (1 two and 1 one). That still only carries a 1, which is convenient, because it means the carry can be represented in binary just like every other digit. One way to think of it is: According to the logic table we just made, the sum should be 1 if there are an odd number of incoming 1s. XOR is the operation that matches odd inputs. And the carry should be 1 if at least two of the incoming digits are 1.
assuming you have a 3-input XOR gate. If you don’t, you can just hook two 2-input XOR gates together. Now rename C to Cin, and Carry to Cout, and we have a “full adder” block that can add two binary digits, including an incoming carry, and generate a sum and an outgoing carry. And if we put a bunch of them in a row, we can add any N-bit numbers together! 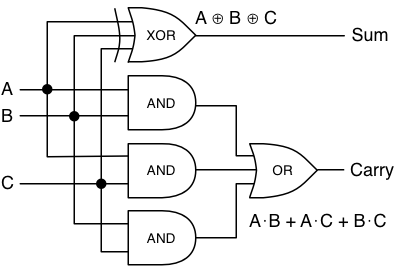 Starting along the top, there are four inputs each of A and B, which allows us to add two 4-bit numbers. The right-most bit, A0, is the “ones”, A1 is the “twos”, and so on through the “fours” and “eights” (powers of two instead of ten). On the far right, we have a dangling carry-in which we’ll just set to zero so that it doesn’t matter. The carry-out from the right-most adder is passed along to the second adder, just like in long addition: any carry from the “ones” is added to the “twos” column. Finally, on the far left, we get an “extra” carry out, because the addition of two 4-bit numbers may require 5 bits. Normally this is considered an “overflow”, but the carry-out bit is stored in some kind of status register by every CPU that I know of. It just usually can’t be accessed from C or any other language directly, so it gets lost. But here’s where the problems come in. Imagine setting up 64 of those adders in a chain, so you could add two 64-bit numbers together. How long would it take? The circuit diagram above shows that each sum goes through one or two gates, and each carry-out goes through two. And the carry-out of one adder becomes the carry-in for the next one. So to generate the entire sum and the final carry-out bit, we need to go through 64 ⋅ 2 = 128 gates. Spoiler alert: No CPU has time to wait for 128 gates to flip in sequence, so no CPU actually adds this way. The problem is that the carry bit needs to “ripple” across each bit, and will only scale linearly with the number of bits being added. We’ll need some way to break out of linearity. The weird rhombus-shapes are multiplexers, or “mux” for short. 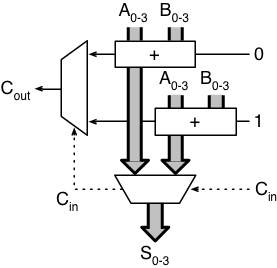 A mux takes two inputs and selects one or the other, based on a control signal. In this case, each mux uses the carry-in signal to determine which adder output to use, for each of the four sum bits (along the bottom), and the carry-out bit (on the left). 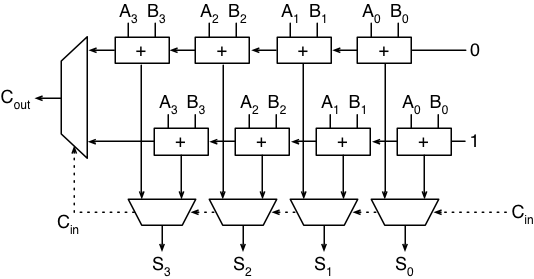 If we assume a mux takes as long as a logic gate, then this circuit can compute a 16-bit addition in 2 ⋅ 4 + 4 = 12 gate delays: 8 for all the adders to finish, and 4 for the muxs to ripple the carry bits across. For a 64-bit adder, it would take 24 delays, because it would have 16 muxes instead of 4. Going from 128 to 24 is a great start, and it only cost us a little less than twice as many gates! We can fuss with this and make it a little faster. The leftmost adder unit waits a long time to get its incoming carry bit, and the first 75% of the time is spent waiting for the first adder to finish. If we compute only one bit at a time on the right, then two, then three, and so on as it goes left, we can shave off a few more. But… we can do better. Next time, some tricker adding methods that end up being quicker. Please do not post this article to Hacker News.